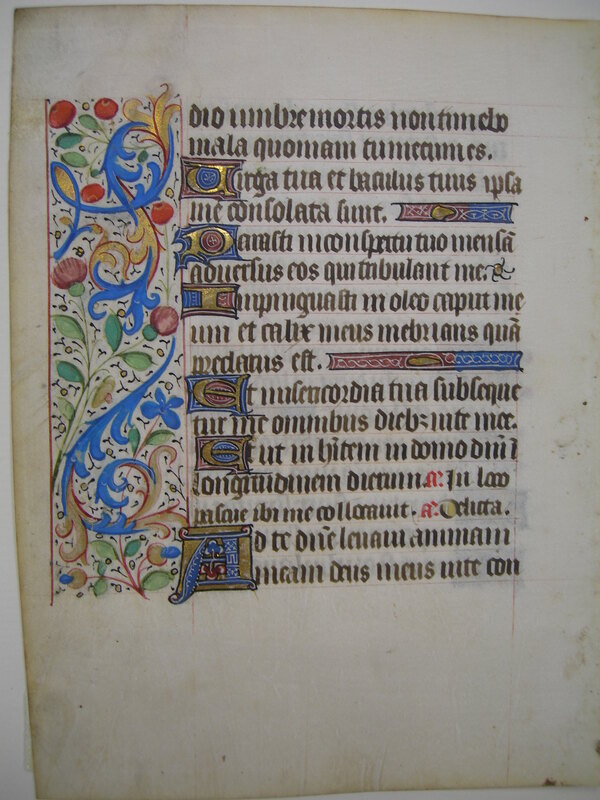 This leaf is from a Book of Hours made in northern France in the late fifteenth century. It measures 16 x 12 cm, and the arrangement of its responses and antiphons indicates that it accords with the Use of Rouen. Blooming on these pages are acanthus leaves intertwined with a truly impressive variety of what Ege calls "wayside flowers," including thistles, gallic roses, strawberries, grapes, and others which are so stylized as to be nearly geometric. The flowers are fenced in by red lining, a thinner form of which rules the text. There are many well-executed illuminated initials, with lesser first letters filled with yellow; occasionally a lone "cut flower" has been used to fill empty space in the text block. Many leaves are stained from use. See Denison University Leaf 46 for more information about this manuscript. 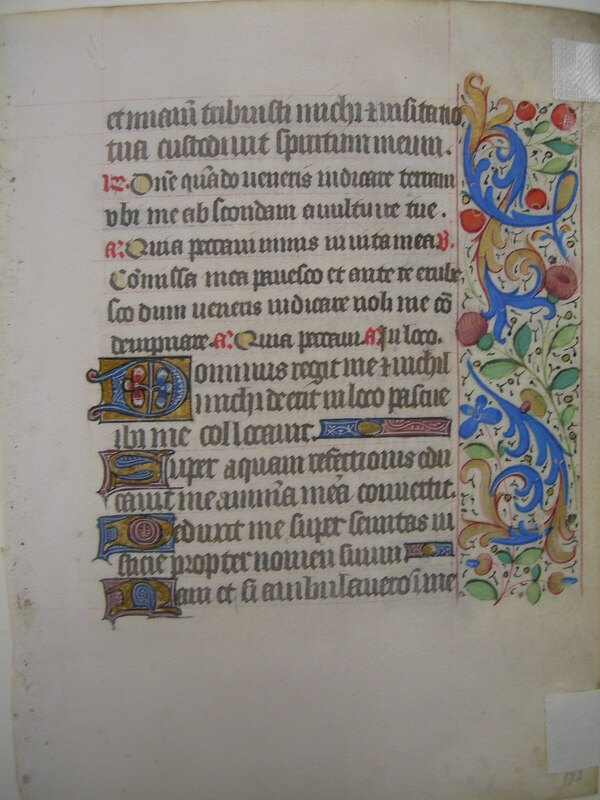 Text: The leaves we have seen indicate that this Book of Hours accords to the Uses of Rouen and Coutances. This leaf contains text from the Office for the Dead at Matins, the first and second nocturnes (specifically Job 10, and Psalms 22 and 24). et misericordiam tribuisti mihi, et visitatio tuo custodivit spiritum meum. R: Domine quando veneris iudicare terram, ubi me abscondam a vultu irae tuae? A: Quia peccavi nimis in vita mea. V: Commissa mea pavesco, et ante te erubesco: dum veneris iudicare, noli me condemnare. A: Quia peccavi. A: In loco. Dóminus regit me, et nihil mihi déerit: in loco páscuæ, ibi me collocávit. [from Job 10] ...and mercy thou hast given me, and thy visitation hath kept my spirit. R: O Lord when thou shalt come to judge the earth, where shall I hide me from the face of thy wrath? A: For that I have sinned too much in my life. V: I do much fear my misdeeds, and before thee I do blush while thou comest to judge, do not condemn me. A: For that I have sinned too much in my life. A: In place of pasture. -dio umbræ mortis, non timébo mala, quóniam tu mecum es. Virga tua, et báculus tuus, ipsa me consoláta sunt. Impinguásti in óleo caput meum: et calix meus inébrians, quam præclárus est! Et ut inhábitem in domo Dómini in longitúdinem diérum. Ant: In loco pascuae ibi me collocavit. Ant: Delicta. [continues Psalms 22:4-6] ...of justice, for his own name's sake. 4 For though I should walk in the midst of the shadow of death, I will fear no evils, for thou art with me. Thy rod and thy staff, they have comforted me. 5 Thou hast prepared a table before me against them that afflict me. Thou hast anointed my head with oil; and my chalice which inebriateth me, how goodly is it! 6 And thy mercy will follow me all the days of my life. And that I may dwell in the house of the Lord unto length of days. Ant: In place of pasture there hath he placed me. Ant: The offences.